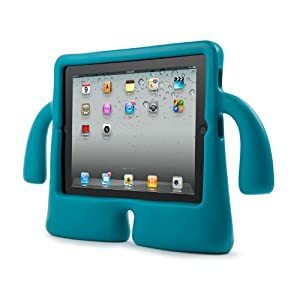 iGuy iPad & iPad 2 Case from Speck - Finally, A Little Whimsy! For having the marketing spin of being a fun family device, most iDevice accessories are bland, practical affairs with all the style of a boardroom meeting. Oh, sure, maybe your rubber band case in pink or… seafoam, but that’s about the extent of the whimsy. Say ‘Hi’ to iGuy! Available in three colors, iGuy Standing Cover for iPad 1 & 2 is a lightweight foam standing case. Get your iPad ready to lead the Robot Revolution! iGuy is $40 from Speck and is available in… OMG, I hadn’t read this part yet. Okay, hold my hair in case I throw up. Ready? iGuy retails for $39.95 and is available in your choice of Lime… Mango… or… Peacock. iGuy: a film from Speck Products on Vimeo. I sooo need one of these for the blog! Imagine iGuy stomping on Playstations for article pic! Or babies with iGuy! Now I just need to convince the Mrs that this is a business expense for a business that never made a cent. Hmm. I bet iGuy would know!